In light of the recent release of Charles Woodson and the retirement of Donald Driver, it's evident that the Packers are about to embark on lots of changes this offseason. They have no choice. For the past two season, there have been pivotal areas the Packers needed to fix and came up short. Whether that may have been caused by injury or just pushing the issue aside, it is time to come face to face with these concerns and get the Packers back to the Super Bowl. I have come up with three more things the Packers need to do with offseason in order keep pace with the success they've had in the past three years. 1. Let Greg Jennings walk. The Packers should be comfortable without Jennings being there, regardless of what some may argue. Jennings was injured for nearly half the season last year, yet Aaron Rodgers was still able to put up NFL leading numbers last season by finding and trusting the other targets he has. Jordy Nelson, James Jones, and Randall Cobb are a formidable trio that I am one-hundred percent behind if that is the direction Ted Thompson wants to go. And we don't need to sacrifice a high pick in the NFL draft for a new wide receiver, either. A wide receiver in the that should be available in the fourth round that Green Bay could look at is Josh Boyce out of Texas Christian University. He's six-foot tall and two-hundred pounds and could be a possible kick returner and easily a great fourth wide out option for Aaron Rodgers. If we go deeper into the draft, in the fifth round Corey Fuller from Virginia Tech should be there. Sixth round, six-foot-two Chris Harper from Kansas State could be still available. If we do go for a wide receiver early, I've been really high on Marcus Davis our of Virginia Tech, and so has Ted Thompson. Davis was originally projected to be a seventh round pick but has raised a few eyebrows and is quickly rising on many draft boards. In any event, I am not at all concerned over our wide outs because of the talent we have already and for the fact that Aaron Rodgers knows how to play his position from what I hear. 2. Sign free agent running back Steven Jackson. We all know it. The running game has been a concern for the Packers for a while. Even before they won the Super Bowl. We haven't had a legitimate run game to balance our passing game since Ryan Grant's 2009 season. I still argue we haven't had a running game for a decade back when Ahman Green was the Packer's running back. The next testimony is that "Ted Thompson doesn't like signing free agents." Yes, I know. Ted can't even hold a candle to Ron Wolf when it comes to free agent signings as Ron was responsible for bringing in the likes of Reggie White, Desmond Howard, Frank Winters, and Santana Dotson just to name a few. If Ted wants to improve the team at the running back position, he'll give Steven Jackson a long look this offseason. Unlike Cedric Benson, Jackson is a league veteran that Green Bay needs. Jackson has had eight straight seasons of 1,000+ rushing yards. He's a proven runner that would excel with Green Bay as well as mentor the new blood that comes in. The Packers rarely make mistakes in cap management, and I don't see them starting a bad trend any time soon. The Packers will be coming into the 2013 season as a Super Bowl contender again. They will need an established running back to take them to the next level of success. 3. Focus on defense in NFL Draft. The Packers are projected to have nine total picks in the 2013 NFL Draft. They are slated for one pick every round along with compensatory picks, one in the fourth (Matt Flynn) and one in the seventh round (Scott Wells). (Note: Pat Lee will not get Green Bay a compensatory pick.) The order of the compensatory picks has yet to be determined, but those rounds should be accurate. I'm not saying all the picks need to be focused on defense, but it needs to be a focal point. I'm suggesting that two of the top three picks should be directed towards the defense. Top voids are replacing Charles Woodson in the secondary, matching a linebacker with Clay Matthews to improve the pass rush, and a defesive end to replace Mike Neal and provide a plan B for an unproven Jerel Worthy. First, the secondary. Since losing Nick Collins, the Packers haven't been able to solve that puzzle on that position. The Packers need to take a chance somewhere in the draft and take a safety/corner back to add depth to Morgan Burnett, Jerron McMillian, and M.D. Jennings. I doubt Ted will draft early on that position, but a guy like Robert Lester from Alabama or Zeke Motta out of Notre Dame would be a great sixth round pick for the Packers. Looking for a pass rushing linebacker will come a lot sooner than the late rounds. I'm thinking fourth round is most likely, just because of the two picks we will have on the table for us. Gerald Hodges from Penn State, Jelani Jenkins out of Florida, or Sean Porter out of Texas A&M would all be great pick ups for Green Bay at that stage of the draft. Finally, the Packers need to beef up the defensive line. This needs to happen in the top part of our picks. I would love to get it out of the way with the first pick, to be honest. 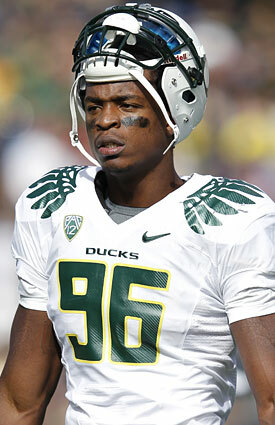 Dion Jordan from Oregon would be the guy to go with who would be still available at that point of the draft. He's six-foot-seven, two-hundred thirty-one pounds of brute strength. He could compliment B.J Raji and C.J. Wilson when Ryan Pickett isn't in there. He'd add the depth we need on that line. The rest of our picks will be geared towards a wide out, offensive line, and hopefully a kicker. I see the Packers bringing back Jermichael Finlay so we won't need a tight end. I stated before that a running back won't be necessary if we sign a free agent running back. There's a lot of upside coming into this offseason and heading into the NFL Combine that is already underway as I type this. Regardless if my ideas are right or not, I just hope the Packers draft smart and get the best available people and not just necessarily what we have voids in. In Ted Thompson I trust.